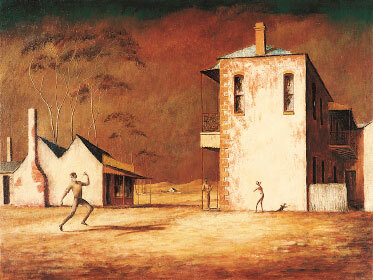 Russell Drysdale: The Cricketers, 1948. Raymond Depardon: Désert du Téneré (detail), 1989.
this which, no less importantly, was used as a cover image for L&apos;Estranger [The Outsider]. Danijel Zezelj: from Stray Dogs (detail), 2004. Hugo Pratt: from La ballata del mare salato (detail), 1967.
this. Both of these graphic novelists, interestingly enough, are chiefly concerned with monochrome explorations of the most fundamental mechanisms of life. While in Zezelj&apos;s work the fine lace of detail dissolves into spare lush strokes of black on white whenever a larger theme is brought up, so do Pratt&apos;s characters regularly meander out of world wars and treasure hunts to walk empty beaches and have existentialist dialogues. According to Sagi and Stein, Camus is concerned with concrete existence, which he thinks of in terms of the basic encounter with immediate experiences, exemplified by the sea and the sun – what they term &apos;his Mediterranean thinking&apos;. In this sense, he continues the existentialist-phenomenological tradition of the Husserl/Kierkegaard/Hiedegger variety. Aesthetically, his writing contrasts the experience of the sea as immersion into absolute immanence to the existential alienation of the sun. In front of the blinding sun, we are reduced to our barest humanity. Who doesn&apos;t know that heavy feeling of heat, turning life into abstract, thoughtless being? The idea of &apos;Mediterranean thinking&apos; is something that appeals to me, although I would stretch it to include hot and dry climate more broadly.In hot climate, all the questions appear more basic: all major religions have sprung up, fundamentally, in the desert, and so have philosophy and mathematics and tragedy. Pursuit of principles, so to speak. Standing in the front of the sun, one is never much more than simple geometry. George Hoyningen-Huene: Untitled (Bathing Suits by Izod) (detail), from Vogue, July 5 1930. A bit like the unavoidable abstraction of the beach body. But this all came much, much later. Sunstruck was a piece of performance that blinded, cleansed; it left one feeling sated on pure ether, heart full of empty space. Discursive response was impossible for days after, the pure and amimetic unsuggestiveness of Sunstruck slowly letting the contradictory, overwhelming wealth of emotional response build into something more than speechless awe. With nothing more than two men, dressed in black, one circle of chairs, one rotating sun, a fantastically fluid incorporation of the enormous shedspace into the relatively unspatious performance. Livia Ruzic&apos;s soundscape alone makes fifty percent of the experience. The choreography is never more than a rich hint of human existence itself, two men moving like blinded by great headlights, like on that Algiers beach, and it is no wonder they are men, and not women. Something about the lines being cleaner. The sea, I hear you smart kids wondering, is also present, if nothing in the seagull cries right before the end, the seagulls flying over the construction landscape outside our enormous shed. If we believe in Camus, and there is no reason not to, it is at this point that the absurd finality, limitedness, of bare existence makes peace with the immanent, and the two two-dimensional men merge with the world. There is, really, nothing more. Like that Japanese cottage in spring, like utsubo, a quality, greatly appreciated in buddhism, of being empty in order to contain the immense, hollow as an ability to become full. A bit like the capacity for pregnancy. It just seemed to encompass everything about men and joy and inexorable tragedy and struggle and continuation and children and inevitable loss and sadness and wisdom and compassion. It was one of the most empathetic pieces I have ever seen. In this year&apos;s Arts Festival, with such aggressive preponderance of explanation, of persuasion, of unfulfilled promises, Sunstruck shines like a supernova, all understatement, undermovement, all viscous substance. By plunging as deep as possible into an atmosphere, a sensation, unexplained, unjustified, unconceptualised, it encompasses everything and more. MIAF. Sunstruck: a premonition of events from memory, fantasy and the imagination. Concept collaboration: Helen Herbertson and Ben Cobham. Directed by Helen Herbertson. Design and lighting by Bluebottle/Ben. Physical realisation by Helen Herbertson, Trevor Patrick and Nick Sommerville. Set realised by Alan Robertson. Soundscape by Livia Ruzic. Music by Tamil Rogeon (violin) and Tim Blake (cello). Production by Bluebottle/Frog. Shed 4, North Wharf Road, Docklands. Season ended. Kids Can Get Lost: A Live Instructional Guide on Safe Family Roadtrips. Devised by Spilt Second. Producer/artistic director: Matthew Kneale. Director: Dan Koerner. Costume designer: Esther Hayes. Sound designer: Rob Stewart. Performers: Paul Bongiorno, Reuben Brown, Josh Cassidy, Shelly Lauman, Ellen Steele, Wazzadeeno Wharton-Thomas. Narration: Simon Godfrey. Season ended. It is a remarkable testament to the Melbourne grassroots theatre culture that Kids Can Get Lost sold out most of its season. A part of the Next Wave festival, set out of the theatre way in an absolute sense, demanding comfortable footwear and wearing of unfashionable clothing; and yet. In a sense, Florida was right and wrong about Creative Cities. Any place can set up an event, but only in Melbourne will people attend, commit. It is this base of mutual support that all our great theatre is growing from. Kids Can Get Lost is a good example of this poor theatre, put together with not much more than love and ingenuity. The core of the show is a sort of mime on dangers of family travel – dangers as wild and imaginative as any danger Australians are warned of in real life: kangaroos on the road, homicidal teenage hitch-hikers, tidal waves, wrestlers in full costume. It features a killer soundtrack, subtitles, and commercial breaks. Audience interation, and dancing! It&apos;s utterly enjoyable. However, quirkily, the venue is under, over and behind City Link – the audience is equipped with stools, guided from Flemington Community Centre in tidy rows of hand-holding twos, repeatedly briefed on safety procedures, in case of cyclist encounter, or road collapse. (Apparently these were genuine concerns raised by CityLink, safety procedures genuinely needed to be put in place, only adding to the overall merriness.) None of this creates ground-breaking theatre, of course, but it does result in intelligent entertainment of very high standard. Site-specific theatre of this kind tends towards psychological flatness. Probably due to the lack of intimacy in vaguely defined space of performance, it gets closer to light entertainment, spectacle. It parallels the way mass spectacles (opera, festivals, summer open-air performances) are primarily an experience of a place (the stadium, the festival town, the castle) and the socially-placing genuis loci (upper-class, exclusive, opulent). While attending some such spectacle invariably bonds the spectator with the upper-class city, walking through the meandering underpasses of City Link we are learning to love a neglected part of Melbourne, one populated by public housing, lone skaters, western-suburbanites stuck in traffic jams. When the car headlights go off (the only source of light for the show), and we are left in the warm, moody silence of a show packed-up, its bittersweet, somewhat retro, somewhat ironic, mood lingering in the air, in the dim lights of the infamous phallic accessories to road construction (cheese sticks for youse from elsewhere), the hum of the road in the distance, it is hard not to feel proud, and full of love for this little city that does quirky so well. We walk back, some of us still holding hands, and it was worth it. After the untimely death of the brilliant Tanja Liedtke, the just-announced artistic director of the Sydney Dance Company, the company commissioned work from three choreographers, ad hoc, to fill up 2008 while in transition. Meryl Tankard was one. Inuk2 was based on her 1997 Inuk, meaning &apos;human&apos; in Inuit, a work I haven&apos;t seen. By a choreographer I don&apos;t know, performed by an ensemble that&apos;s just a group of strangers to me. The first is the key to the beauty of dance. The key to the beauty of dance is half-unlocking for me through the way I always prefer to post photos of a dance moment, rather than video clips. The sheer beauty of the human body, of the movement congealed, arms and legs stuck in time, hanging off the layers of thick air. Can you see what I&apos;m saying here? For the longest time I dreamed of being a theatre photographer. I would smuggle cameras into the auditorium and steal photos like kisses, of curtain calls, of bare feet, of midmotion and endmotion and premotion. Meryl Tankard&apos;s Inuk2 was going to be my final splurge in this godforsaken land, a piece of Australia to take traveling with me. Was it? It was. After a stint at Next Wave (forthcoming) viewing &apos;indigenous&apos; theatre that, to broadbrush, didn&apos;t seem to come from very deep, it felt almost aboriginal, unashamed, in the way it invoked this country, the experience of this country. It was a dance from the stomach, not the mind. And it succeeds and it fails, of course. Just like Australia, it doesn&apos;t quite know whether it&apos;s gruesome drama or a gentle comedy. The first part, The Freeway, is exquisite: all 1930s or so, gentle, feminine, a pointe, with a beautiful girl dissolving into the ethereal immensity, say, of the road. Lost children, the engulfment of the wilderness. Beautiful lighting design. I thought, this is the most beautiful thing I have ever seen on stage. The next moment, as we come through to the other side, suddenly we have feminist gymnastics. The Tribe is the longest, most repetitive and most philosophically dubious part: although it gave me some food for thought over politically engaged art, what if the feminist in me disagrees? What if women will never beat men in physical fight and what if that&apos;s not the point? So I suffered through. Perhaps it&apos;s my aversion to group sports. The third part, The Party, after the interval, is another brutalist look at Australia: goddamn, there is something about that billboard of the blue sky. It was wiping the floor with the audience. Dancing, drinking, mating rituals, and a harrowing sequence that will be remembered as the Binge Drinking moment; all under this billboard. The rubbish! The crying! Balkan Beat Box in a dingy discotheque: we are a global tribe after all. With the unruly and imprecise (not to mention aggressively laid-back), but so is Australia, The End out of the way, all four corners of this country were covered: a brush at sublime, the youthful energy, the unstructured dark night, and the final slapstick song&dance. No wonder one is confused about whether life here is happy or utterly miserable. It seemed so Australian that it almost made fun of my intention to keep Inuk2 in my heart during overseas travels; as if it said, this is how we do things here! When we&apos;re unsure of the message or the mood, we attach a lightweight coda. Inuk2 is patchy, but gutsy. Convinced in ideas, but not in execution. It is very much the product of a company in transition working with a new choreographer. Not everyone comfortable in their roles, not everyone utilised best. The bold and beautiful Sarah-Jayne Howard visibly excels, but is also Tankard&apos;s frequent collaborator and not a member of SDC. The random succession of music, moods and styles was deliberate, and if it worked, it worked to the extent to which strong scenes rhythmically broke this mechanical rotation of scenes, this MTV drone. Again the photo quality of dance. Suspension of air and body. But there was a too-muchness: too many superfluous people on stage, too many disagreeing elements. Nina Simone!, Inuit singing!, r&apos;n&apos;b! The water extravaganza at the end was annoying, rather than adorable, and not everyone seemed convinced by their direction. So, like tourists, we are left with a collection of beautiful images not quite giving us the answers. The lines in the airport tarmac. The blue sky billboard. The drunk woman. The tribal games. The rubbish. Oh the rubbish. And if that didn&apos;t remind me of one very early, muggy morning in Portugal, when newspapers and rubbish were rolling everywhere, taking over the streets (something about the street cleaning in Portugal was explained to me), and I felt cold, unhappily in love and disappointed in the state of humanity, and I&apos;m sure many people had the same pangs of recognition in same intervals, I don&apos;t know if I would call it successful. As it ended, though, with the beautiful images hung at regular intervals on the walls of this lunapark ride, it was puzzling and beautiful and rewarding. The second is the theatre audience. Sitting in the foyer of the Arts Centre at these un-indy shows, these big ballet shows with ballet audiences, always full of skinny (skim?) girls with long curled hairs and slight tweenager make-up and semi-high heels, and their mothers with plucked eyebrows and furs, you understand, all black and stylish, I used to feel like I used to feel in front of Europeans (we all have our Europeans, perhaps). I used to feel alone, and short-haired and perplexed in front of this teeming femininity, somehow untaught the rules of being a girl and, by extension, of being civilized: the rules and reasons to hair removal, to make-up, to the tricks of always smelling of expensive perfume, not dry sweat, and the entire cacophony of confusion over what women do in toilets. The awareness of my grandmother, who may have read the entire Chekhov – reading is a cheap hobby, thank Lord for socialism and libraries – but has never been to ballet. The expensive good seats, the glossy programs with artistic pictures (quite unlike the little gold-coin-donation ones I am used to), it all combines into a feeling of not quite awkwardness, but, rather, of being completely alone. I am sure there are those who don&apos;t like the idea of cheap seats, of matinées, of young immigrants speaking too loudly in their theatres, stepping on their feet or making out in opera. I&apos;m sure there exist those willing to argue of the benefit of rules of conduct, dress codes, conversation etiquette. More so in Europe, or even North America, than in this convict colony. But they exist. Later, when the show starts, it doesn&apos;t matter anymore. The questions of how many good eyebrows are raised over scenes of binge drinking don&apos;t even feature. We are all equals in front of art. But outside, in the foyer, I am as alone as in front of death. I am de-tribed. Does that change our perspective of the play?